We also try to give back to whatever community we live in, in whatever way we can. We donate clothes, toys, small appliances and food all through the year but at Christmas time especially... a time associated with giving. We started doing Operation Christmas Child, run through Samaritan's purse, a couple years ago after Cassia was born. Nothing breaks my heart more than a child in need. Although we aren't Christian, I really like their concept as you can choose the age group you can give to and the items you wish to give. You can do toys, toiletries, books, hard candy and even clothes but it just needs to fit into a shoebox. This year as Cassia is four, I wanted her to participate, explaining that lots of kids her age don't have as many toys as she has. She really got the concept- I explained to her what the program was about and how the shopping was for a little girl exactly her age whose family could not afford to celebrate Christmas the way we do. So off we went to Target, just me and my girl. 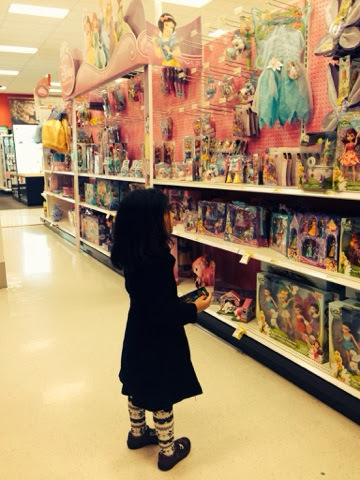 She was very good about the items she chose- selecting things she would like for the little girl. Then, she began to imagine what the little girl was like- apparently a fan of Hello Kitty, hair clips and pink. 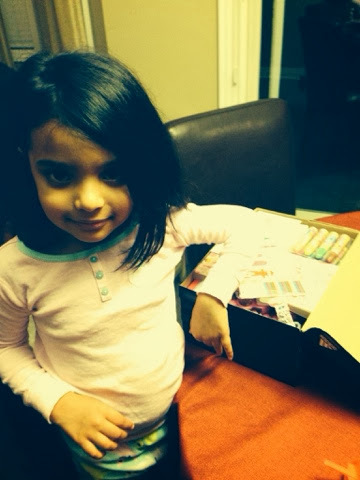 We also used this opportunity to purge our craft box of all these new crayons, markers and stickers we had. Yes at first, she did ask well what about me... why can't we buy stuff for me too? And when she saw us taking her stuff, she initially was upset. She's four after all. After an explanation, she accepted and is still thinking of what else we can put in the box--- which by the way is stuffed and ready for drop off. I really enjoyed this fun outing with my girl- this is the start of a yearly tradition to herald the start of the Christmas season.